It’s important to keep your home clean and tidy with regular cleaning and maintenance. However, as time goes by, your carpets and overall home become dirty and cluttered with a mixture of junk and personal items left behind, until your regular cleans are barely keeping up. Giving your home a spring clean is a great way to give your family and your home a fresh start. Below are some great tips from Midland Cleanpro to keep in mind when creating your spring cleaning list. 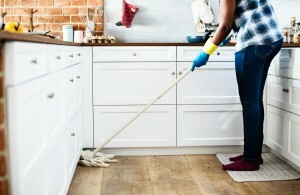 The majority of homeowners will spend most, if not all of their attention on the interior of their home during a spring clean. However, given that it receives little attention and suffers against the elements, it’s worthy of your attention during your spring clean. Take a tour of the outside of your home with your family and identify any small maintenance or cleaning items. This could range from something like a clogged drain to simply washing away from grime with a garden hose. When completing this task, it’s important to identify the difference between a DIY task and maintenance which required professional attention. For example, if you haven’t tended to your outdoor tiles in a while and there are problems with your grout, speak with a professional. Nobody enjoys moving heavy items around their home, however, if you are going to perform a task, you might as well perform it thoroughly. Instead of just vacuuming around your heavy furniture items, enlist the family and move each item, providing a thorough vacuuming, and stain removal if necessary. Not only is this a great way to ensure a thorough spring clean, but it also provides an opportunity to identify any damage, such as mold underneath your couch from a spilled drink or damage to a wall behind an entertainment unit. If your carpets haven’t seen a professional clean in a while or your upholstered furniture has never known such treatment, your spring clean is a perfect time. Speak with Midland Cleanpro at (432) 889-7199 and find out their ION exchange carpet cleaning system can have both your carpets and upholstery looking its best and dry within hours. While you might not think about it, the space underneath your kitchen sink where you store your pots and pans, along with the hidden away spaces you store your laundry cleaning products provide the perfect environment for mold growth. This year, take a flashlight or even your phone and inspect your cupboards and cleaning item storage areas for any signs of mold or moisture damage. Identifying this damage early can prevent a large problem later. Of course, if you can think of any other spaces around your home which are also both damp and dark, then it’s worth doing the same to minimize the chance of mold growth. Over a long period of time, pollutants and debris will make its way into your home and deep into your carpet fiber. This can cause a range of problems, including affecting the air quality in your home. And while your regular vacuum cleaner is great at general carpet upkeep, however, it can’t remove these pollutants or stains and it can’t bring either your carpet or your carpet runners and rugs back to life. In addition to your vacumming this spring clean, treat your carpets and rugs to a professional carpet cleaning. These services differ from your regular cleaning in that they use professional equipment to wash and dry your carpet fiber, instead of lifting dust and debris away from your carpet. If you can’t remember that last time that your carpets received a professional carpet cleaning or you are tired of looking at a range of stains, speak with Midland Cleanpro at (432) 889-7199 and find out how their ION exchange carpet cleaning system can bring your carpets back to life and leave them ready to be walked on in a matter of hours. Of course, in addition to professional carpet cleaning, Midland Cleanpro also offers high-quality upholstery cleaning and tile and grout cleaning, should you encounter any areas during your spring clean which you aren’t able to satisfactorily clean yourself.